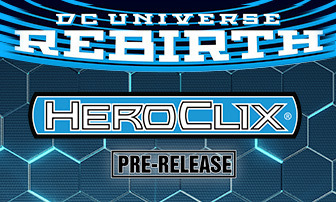 Get your hands on the new DC Comics HeroClix: DC Rebirth up to two weeks before official release! We understand that questions are an important part of improving our products, and we’re here to answer. We love our games and we’re dedicated to making sure you, the players, love them as much as we do. We’re sorry for the inconvenience and hope to rectify your situation shortly. Please follow the instructions below to create a replacement request in our replacement system. Sign into your existing WIN account or click the SIGN UP button to create a new WIN account. Review and update your contact information to make sure we have your correct shipping address. Click the CREATE A REQUEST button at the top. Search for the product(s) containing the components you need to be replaced by typing the name or item number into the search bar and/or using the filters on the left. Once you’ve found the correct product, click on click it to view the components of that product that are eligible for replacement. Add one or more component to your cart by filling in the quantity box for those components and clicking the Add to Cart button. Once you’ve added everything to your cart that you need, you’ll need to upload a receipt. Click the Add files button under the Upload A Receipt section, navigate to your receipt, and click open. The website will display a preview image of your receipt. Once you confirm that you’ve selected the correct receipt, click the Start upload button. Once your receipt has been uploaded, click the Proceed To Checkout button. A pop up will appear prompting you to make sure that everything in your cart is accurate because you will not be able to change it after this point. If you’re satisfied with your cart, press the Proceed to Checkout button on the pop up. If your replacement request includes no collectible components, you’re done! However, if your replacement request includes one or more collectible components, you’re required to send them into us. If this is the case, a Download Packing List button will now be on your screen. Click the button to download a PDF of your packing list. The packing list will have a section on the top for you to cutout and tape to your package as well as a list of what you need to include in your package which includes the packing list itself as well as all items listed under the Request Contents section. If you want to describe the specific issue you’re having with the components you’re returning, there is a section to do so on the packing list. ©2019 NECA/WizKids LLC (WizKids). The marks and logos for WizKids, Dice Masters, Quarriors, Dice Building Game, HeroClix, and Combat Dial are trademarks of WizKids. All rights reserved. All other trademarks and copyrights are the property of their respective owners. Exact products, figures and components shown may vary.